Lama Zopa Rinpoche during public teaching at Great Stupa of Univesal Compassion, Australia, September 20, 2014. Photo by Kunchok Gyaltsen. A student wrote Lama Zopa Rinpoche asking what she can do for her mother who had depression and had tried to kill herself. Rinpoche replied to the letter as follows. I am sorry it has taken a long time to reply to what you asked. You did mention at the airport, I think, that your mother had very bad depression and did not have an open mind to the spiritual path. Yes, it is very right from your side to have unconditional loving kindness. That is in the Mahayana teachings; it’s the most important subject. The way to think is that you have received all past happiness, since beginningless time, from her. On top of that, all your present happiness. On top of that, all the future happiness. Not only this life’s happiness, but ultimate happiness – liberation from samsara, the total cessation of all the obscurations; and the completion of all the realizations, full enlightenment. “Enlightenment” – the word has been used since Buddhism came to the West. When Western people started to take interest and learn, that was when the word enlightenment started to be used, but it didn’t have much meaning. It means “light dispelling the darkness.” But enlightenment means so much more than that. In Tibetan the word is “sang gyä” [“buddha” or “buddhahood”]. “Sang” means “the elimination of all the obscurations” and gyä “fully developed all the realizations, nothing more to gain, to actualize everything, it is completed.” So it is an unbelievable, unbelievable, unbelievable, most rich meaning. But just saying enlightenment – for people who know the word, who have been learning Buddhism – the word itself doesn’t give that same meaning. That’s why I translated sang gyä, so you know the exact meaning. Your mother, she is most kind, most dear, most precious, your wish-fulfilling one. From your side, what you can offer her is every single benefit, because she is the most important one. Now, like this, all the rest of the sentient beings – the numberless hell beings, numberless hungry ghosts, numberless animals, numberless human beings, numberless sura beings, numberless asura beings and the numberless intermediate state beings – they all are exactly like her, the most kind, most precious, most dear wish-fulfilling one. Every single benefit – big or even small – every single benefit that you can offer to others and to her – it’s unbelievable. Your mother is cherished most by numberless bodhisattvas. Not just one bodhisattva, but by numberless bodhisattvas, just like a mother cherishes most her beloved child and offers the best of whatever she can give. The mother cherishes her child more anything. The child is most important, even more than her own life. So like that incredible love and compassion and care, numberless bodhisattvas cherish all sentient beings more than themselves. They give up themselves and do not have one single attachment and cherish others. They have totally renounced self and cherish others most. For the numberless bodhisattvas, your mother is more precious than the whole sky filled with wish-granting jewels. Not only filled with dollars and diamonds, but with wish-granting jewels. Your mother is cherished most by the numberless bodhisattvas, more than the whole sky filled with wish-granting jewels. This is how they cherish all sentient beings. This is how they think. They wish to purify and to free all the sentient beings from the oceans of samsaric sufferings and purify the causes of the sufferings – delusion and karma – and not only that, but to purify all the subtle defilements and bring them to sang gyä, the total elimination of all the obscurations and completion of all the realizations. To bring all the sentient beings to omniscient mind, they then try to actualize the path, to purify the defilements and collect merits in order to complete the path, to achieve omniscient mind themselves. Shakyamuni Buddha and all the buddhas cherish your mother most. There is no cherishing the I. Even bodhisattvas don’t have attachment to the I; it has been given up a long time ago, even before having actualized bodhichitta. Numberless bodhisattvas cherish her most, they work for her, according to her karma. Therefore, you can see how important it is for you, due to your connection with your mother this time, to offer her every single benefit you can. This is the best offering to numberless bodhisattvas and numberless buddhas. You can see even offering small benefit to her is the best offering to numberless bodhisattvas and numberless buddhas. For the buddhas and bodhisattvas, all sentient beings are like that. Like how a mother cherishes her beloved child most, all sentient beings are like this to bodhisattvas and buddhas. So please think this way, not only about your mum, but all sentient beings, and all those people who you offer massage to as well. You can recite the mantra of Vajra Armor for your mum, to benefit her. As you don’t have the initiation, you cannot generate as the deity, but visualize the deity in front of you. When you do Vajrasattva, think that your mother is in your heart, on the moon disc. All sentient beings are also there and your mother is in the center. So you purify together, not only yourself, but purify all together. Also, when you recite OM MANI PADME HUM, Chenrezig sends beams to her, purifies her defilements and negative karma, sufferings and depression totally, she is liberated. Then at the end she receives all the qualities and she becomes Chenrezig, as well as all sentient beings, and then yourself. If you have not received Chenrezig initiation in the past, then you don’t become Chenrezig, but think you receive all the qualities, as well as all sentient beings and your mum. This is my message to you. I am very, very, very sorry it took a long time and I hope to see you very, very soon. Time to time, if you have anything you have to ask, please inform me. Scribed by Ven. Holly Ansett, Washington State, US, August 17, 2014. Edited for inclusion in Mandala. 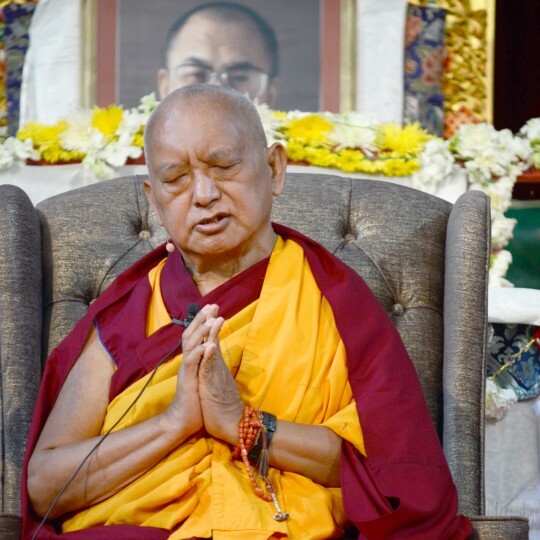 You can read more advice from Lama Zopa Rinpoche in “Lama Zopa Rinpoche’s Online Advice Book,” created by the Lama Yeshe Wisdom Archive.